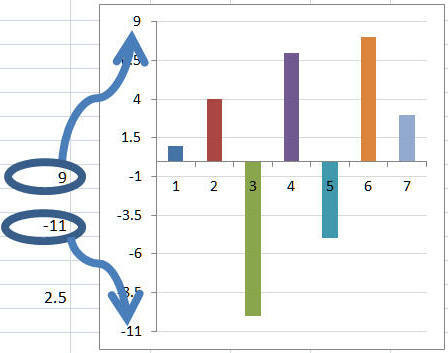 This Excel add-in links the minimum, maximum, major, and minor values of a chart axis to worksheet cells. Thanks for the quick response! Excellent Add-In by the way; just love it! Please use this period to evaluate the product before registering it for continued use. A single-user license is USD19.95. Version 3.6 supports 64 bit Excel 2010. Version 3.5 optimizes the Ribbon real estate required for the add-in by replacing 3 buttons with 1 split button. It also fixes a bug in which after closing and restarting Excel the add-in did not automatically reconnect axis parameters to cells. The add-in worked correctly after it was used once by the user. Finally, the add-in does a better job tracking the registration requirement after the expiration of the trial period.